My classroom has been rife with discussions about perceptions: the pictures in our heads. Since we’re talking about mass media and the frames created when stories are constructed, we’re bound to talk about what happens when we fabricate our own pictures from reality. Adam Gopnik, in his story The Rookie, likened a reader to someone who catches a pitch. You can throw the ball, but you can’t tell how it will spin and how it will be caught. Same with stories about Indians. I might imagine a tale as racist, but someone else might not. Not sure how others will interpret a children’s book about Peter Pan and the Indians that I found recently at thrift store. It’s one of those slim picture books with the gold spine, this one from the Disney studios. Peter, John and Michael set off for Never Never Land where they look for Indians. John, the eldest, plots to capture the Indians, who, in turn, encircle the boys and carry them off to their camp. While the men tie the boys to stakes, “the squaws” carry bundles of firewood and prepare for a feast. While the story has a happy ending, and the Indians aren’t the bad guys after all, the book carries a 1950s sentiment (the movie came out in 1953). As readers we temporarily buy into the likelihood that the Lost Boys will perish in a fire at the hands of the Indians. We also know that, because this is a children’s book created by Disney, the boys will be saved. But for a moment, the Indians (painted bright red) are the enemy and the lads (ethnically “white”) are in peril. That they are saved by Peter is a familiar trope in 1950s Westerns, when the cavalry rescues the prisoners and defeats the warriors. In the Disney finale, all the players are pals, which was the vision of some officials in the 1880s, who hoped to subdue the native tribes rather than exterminate them. This entry was posted in cinema, film, framing, Indian. Bookmark the permalink. I just wrote an undergraduate paper about Aboriginal representations in Disney films, and I definitely agree with most of your analysis. Thank you for blogging about it! One thing I disagree with is the idea that “there’s a danger of reading too much into text-in this case, a children’s book”; I really believe that it would not be reading into the book (and Peter Pan, the film) enough if we don’t read the images and text as blatantly racist. True, they are outdated and now Disney would never have such obviously racist images and words in it’s new films, but these characters and the film are still hugely popular and they play up all of the stereotypes about “Indians”. The “Indians” in the film smoke, drink, speak in broken English, and are represented in incredibly limited ways; there is the pretty Indian girl who needs to be rescued (such as Tigerlily) and the “squaw”. 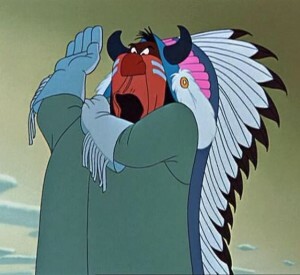 The Chief communicates using handsigns and nature metaphors (like “many moons”). I cannot imagine how the children reading these books, and watching these film could possibly obtain a positive message about what it means to be an Aboriginal person. To me, that means we really need to read further into the texts that we, and our children are exposed to.